Hi friends and readers. Thanks for being a part of Amina Creations. As you would have noticed, I have shifted to my own domain www.aminacreations.com and slowly moving towards my 450th post. To celebrate these two small achievements, I am hosting an event in this blog. The theme of the event is “My signature dish”. We all have that one dish in which we never go wrong, a dish that is mouth watering and delicious - a dish that has won the hearts of our family and friends. So inviting all bloggers and foodies to send in recipes of your best dish. The dish can be anything maincourse, gravy, starter or dessert. The contest starts today and ends on Sep 15 so send in your entries soon. There is also a prize waiting for the winner with a good recipe, presentation, innovation and clear explanation. 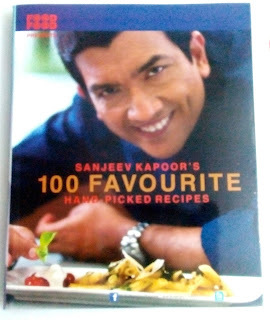 It is 100 favourite recipes cookbook by Sanjeev Kapoor. The book has recipes in all categories- soups, starters, side dishes, desserts, etc. The book can be shipped only in India hence the winner would be required to give an indian address. Apart from this the winner's recipe will be featured in the blog and there are also virtual awards waiting for entries with the best presentation, innovation and photography. All entries must have link to my homepage. You can send any number of entries and archived ones are also allowed. just include a link to my homepage. Use of logo is appreciated but not mandatory. Please do not send entries which contain pork, beef and alcohol. Non bloggers can send their entries to the same email address. Looking forward to your participation and plenty of new recipes. Nice event, will link my entries soon..
Will try to send in something. Thanks for letting me know about the event.